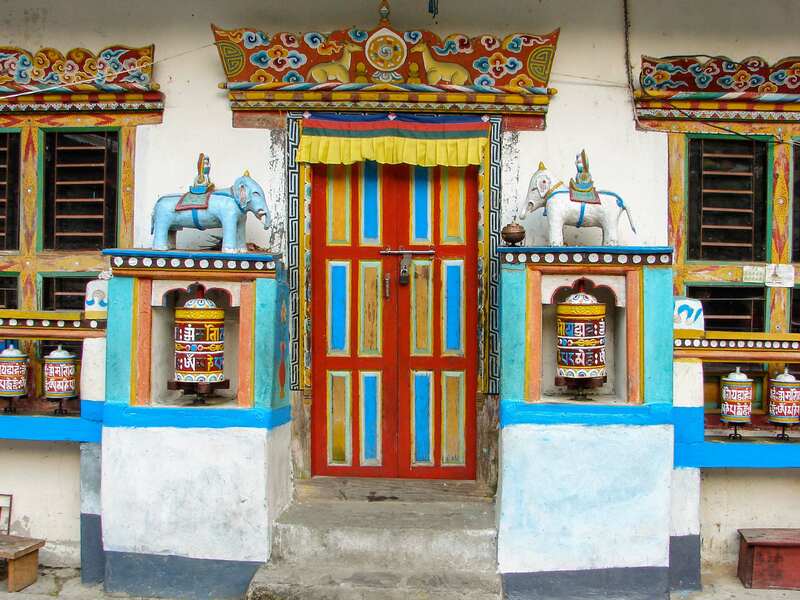 Related Post: The Annapurna Circuit: Is It Still Worth Doing? 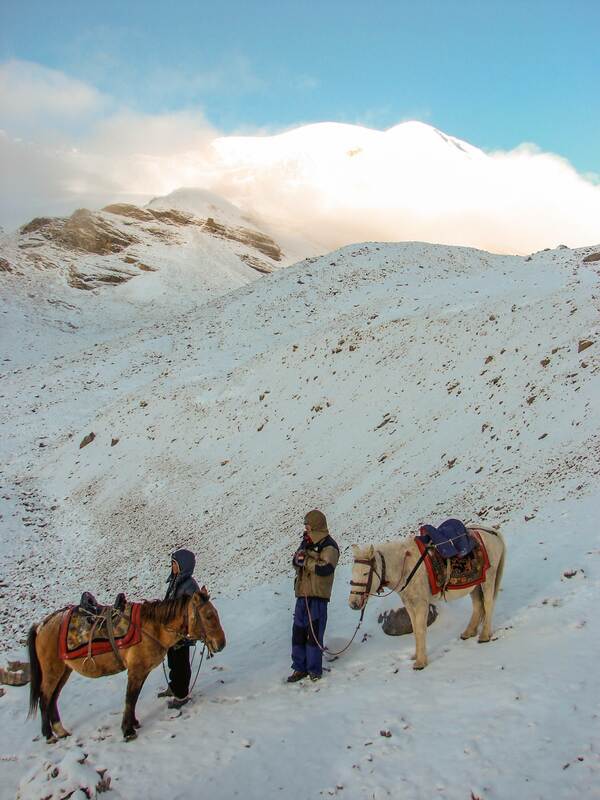 The Annapurna Circuit is one of the world’s great hiking routes. Along with stupendous scenery, walkers find easy accommodation, a clearly defined route that the locals have used for hundreds of years, and enchanting cultural expressions – often in the form of religious architecture or ritual – that have drawn western travellers for decades, ever since the trail opened in the late 1970’s. All images enlarge with a click; all blue text leads to related info with a click. Over a period of two and a half weeks or so, the 225-kilometer walk takes you from the lush sub-tropical environment of Besi Sahar and the Marsyangdi Khola Valley up to the stark windswept alpine region north of Chame before crossing the high pass of Thorung La. 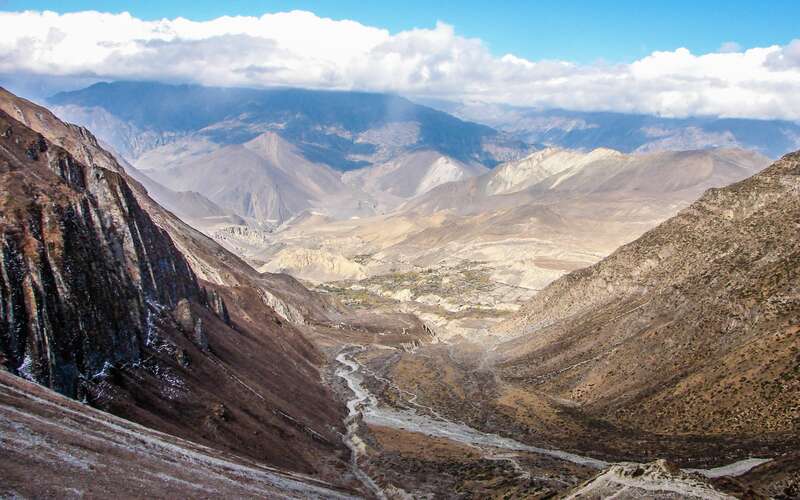 Then it is a 1600-meter descent to the pilgrimage town of Muktinath before following the world’s deepest gorge (Kali Gandaki) down to the end of the walk at Birethati. 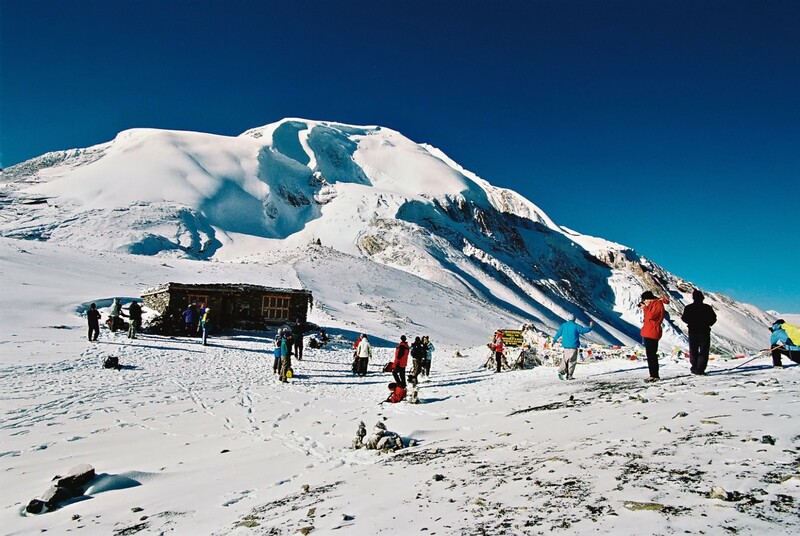 From the altitude profile above it is clear that Thorung La (La means “pass” in Tibetan) is literally – but often figuratively too – the high point of the entire trip. 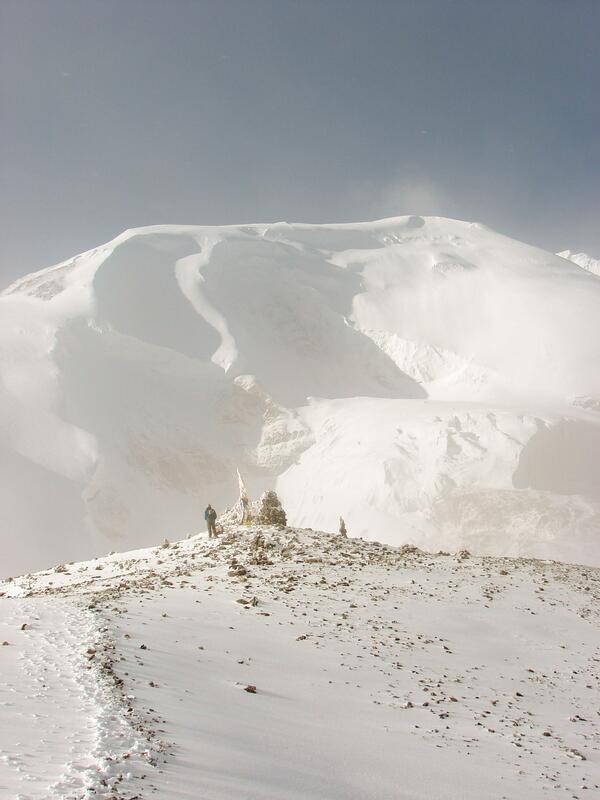 At 5416 m/17769 ft, for most trekkers it will be the highest point they ever walk up to in their lives. It also presents the biggest potential danger of the circuit. 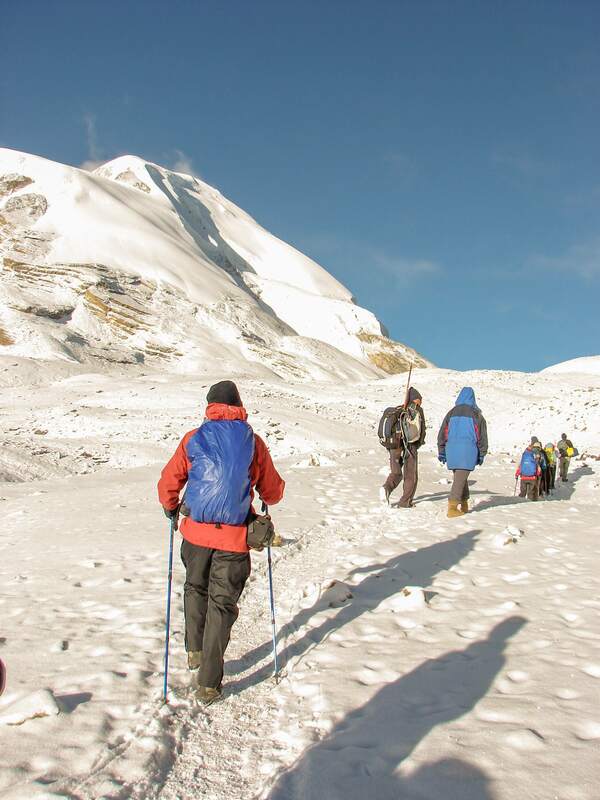 The problem usually lies in the fact the trekkers are ascending too quickly and not giving their bodies enough time to acclimatize to the decreasing density of oxygen in the air. Kathmandu at 1300 meters is where most will begin their Nepali adventure. After the bus ride to Besi Sahar via Dumre, the trail begins with a gradual ascent of the Marsyangdi Khola to Chame at 2630 meters. The chart above makes clear the impact of decreasing air pressure as you gain altitude. While the percentage of oxygen in the air remains the same – i.e. 21% – no matter what the altitude, the column labelled “Effective Oxygen” shows that the number of molecules of oxygen per given volume of air does decrease. This is what people are referring to when they say the air gets thinner as you ascend. You need to breathe a greater volume of air to get the same oxygen that you get at lower altitudes. 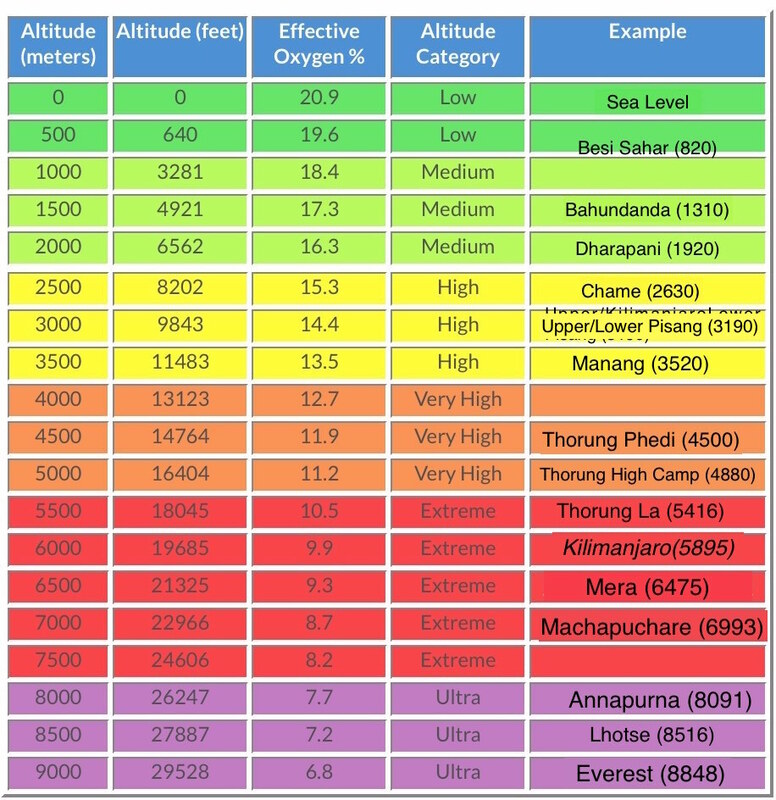 So at Thorung La, for example, the “effective” oxygen level is 10.5% or half of what it is at sea level. That is quite the decrease. We spent five days on the first section of the walk to Chame and another six to get to the Thorung Base Camp Lodge ( altitude 4540 m) just above Thorung Phedi. ((Phedi is a Nepali word meaning “base of the hill”.) Built into the walk up to Thorung Phedi were two extra acclimatization days – one in Pisang and the other in Manang. 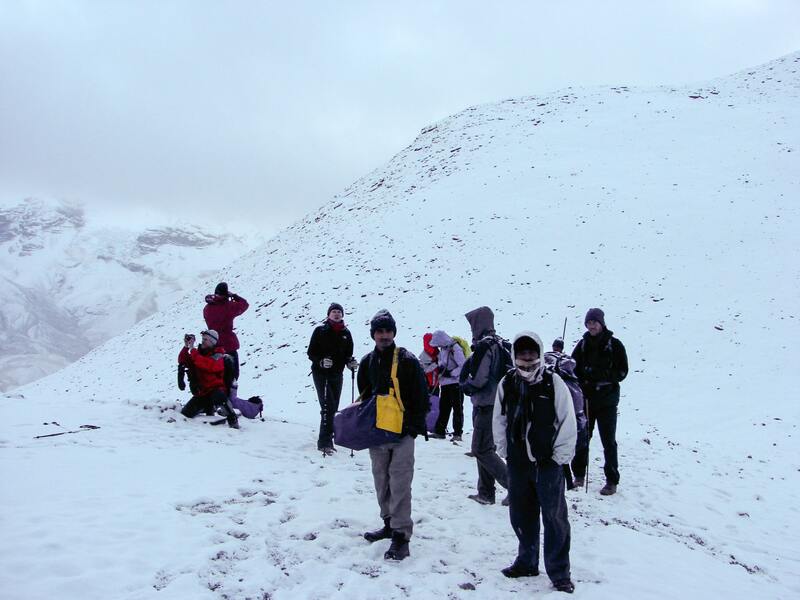 In each case, we followed one of the basic rules of mountaineering – “Walk high, sleep low”. To help us further acclimatize, a few hours of each spare day were spent in the hills above the two villages before we came down in the afternoon to our lodges at the lower altitude. 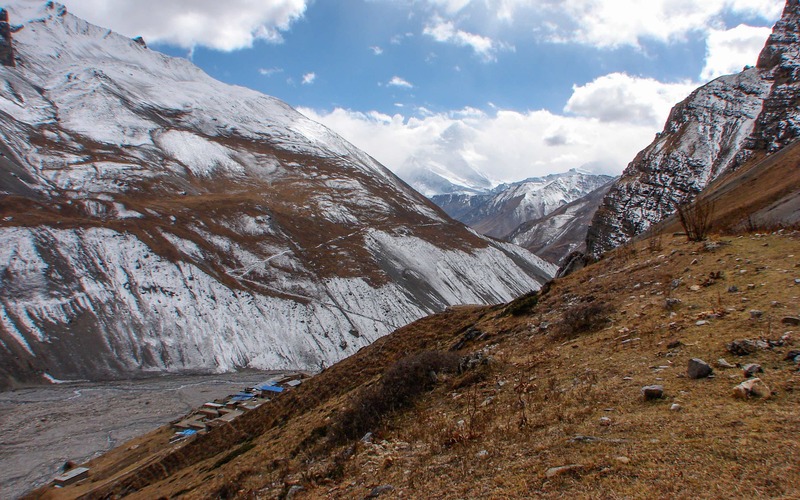 When we got to our accommodation above Thorung Phedi, I went for a two-hour walk in the hills above the lodge. Another general rule of acclimatizing is to set a maximum of five hundred meters in daily altitude gain. 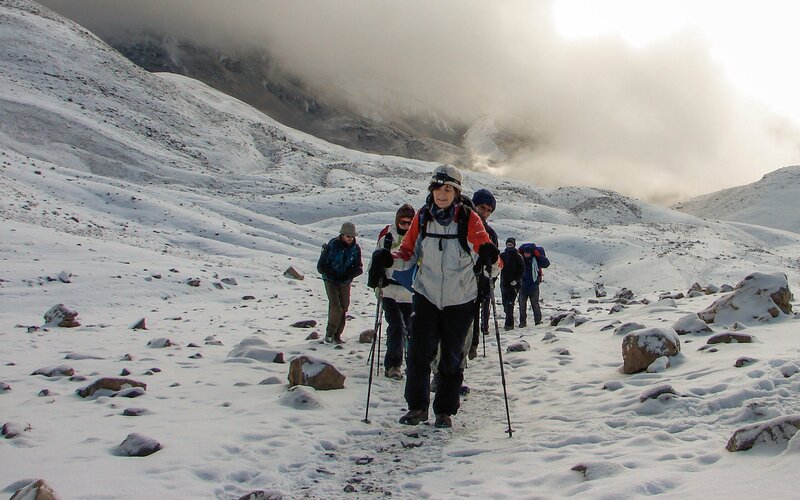 Take a look at how established trekking companies plan their itineraries and you’ll see that they build in a gradual ascent and give enough time for their clients to acclimatize. Clearly, the last thing any trip leader needs is the problem of what to do with a client or three unable to continue the trek half-way through. 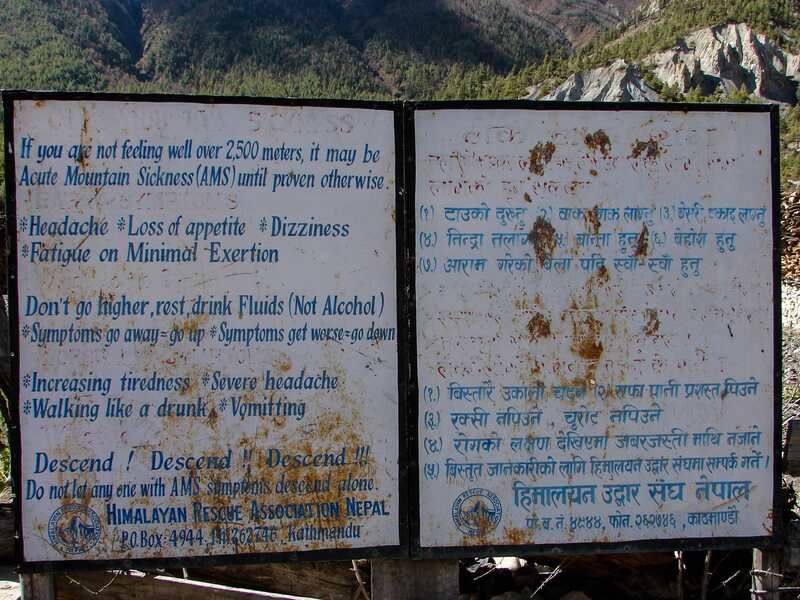 While there is no 100% guarantee that following the above guidelines will make sure that nobody will suffer any effects of altitude sickness, it does make sure that no one will die of AMS. In the end, the profile of someone likely to suffer from altitude sickness would include the following characteristics – an independent, twenty-something male trekker in a hurry to do the entire circuit in 10 days because he has to catch a plane back to NYC in five days. 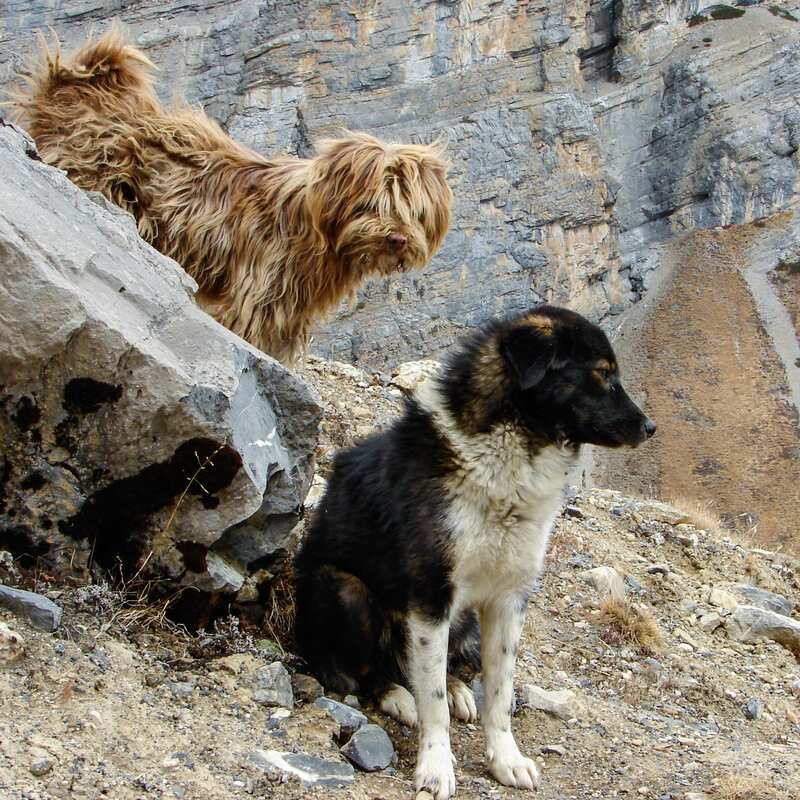 I met him in Manang and wonder what happened to him! 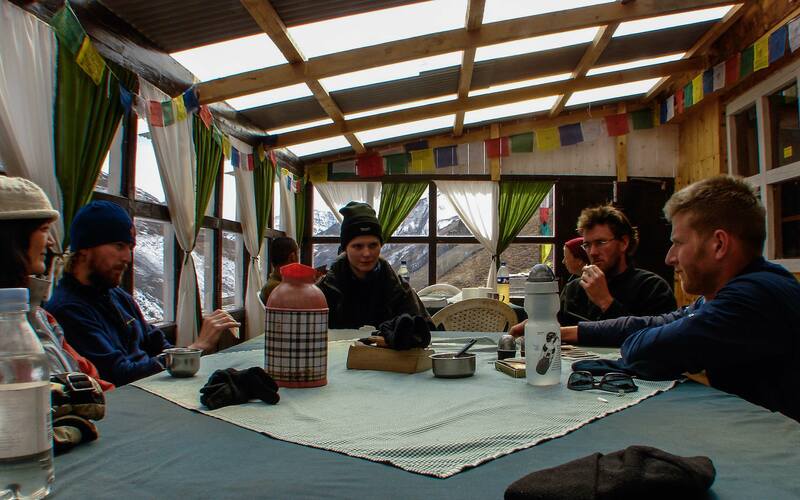 As well, keeping well-hydrated is crucial; notice the water bottles and the tea thermos on the table as trekkers kill some time waiting for the next morning’s climb up to Thorung La. While beer is available all the way up the trail, I stuck to bottled or treated water and tea and passed on the beer until we made the crossing! 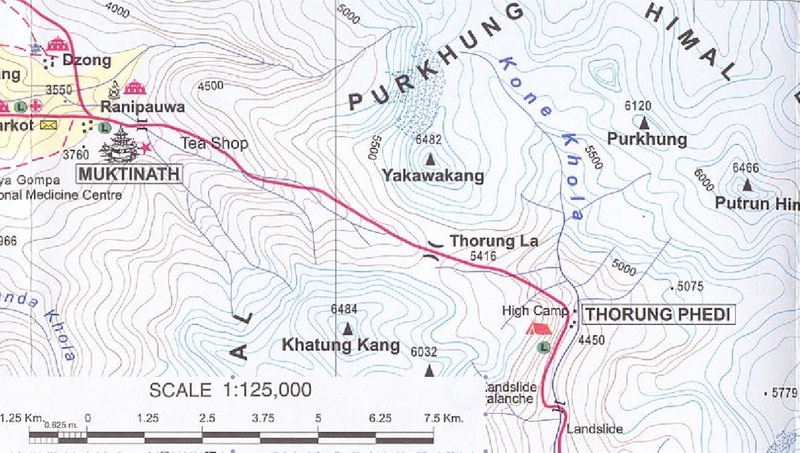 The following zoomed-in Google map of the Thorung La area has the trail on it. You can get a sense of the terrain the crossing of pass involves. I am sure that one day soon the Google team will have a 3D virtual path view available! We got up around three for a 4:30 a.m. departure. The reasoning for the early rising seems to be that the snow will be at its hardest and the winds at their most moderate – whatever the case, lodges in Thorung Phedi will see a flourish of activity as trekkers try to get going. Many will have spent a restless night as they worry about what Thorung La will bring. 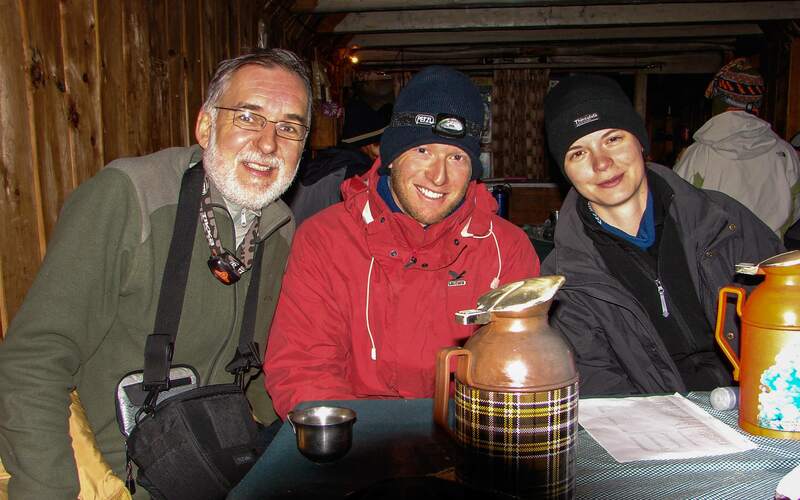 4 a.m. and keen to go – a Canadian, an Aussie, and a German – a mini- United Nations! Our crew of a dozen walkers was ready to go by 4:30; people were wearing all the cold weather clothing they had – fleece underpants and sweaters and wool hats and gloves and those extra thick wool socks. The temperature outside was surprisingly mild and it was completely windless. There are trekkers who are not so lucky, who have to wait for a day or two at Thorung Phedi because of the weather or, even worse, have to retreat back down to Manang or Dumre. 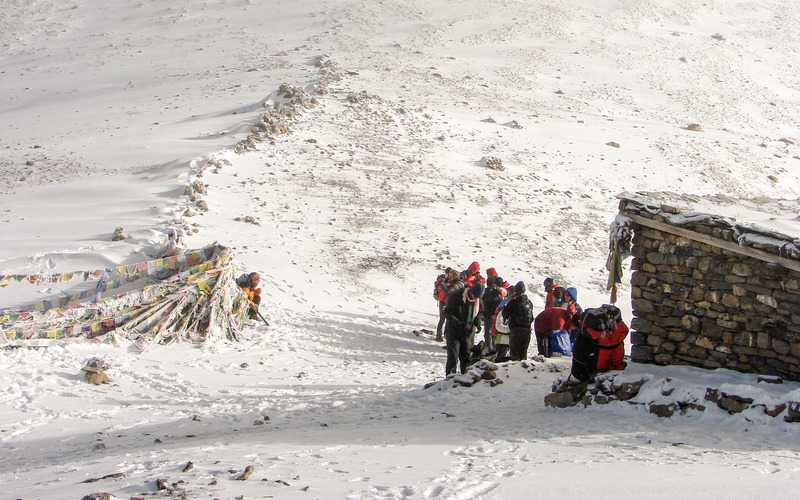 October and November are considered the best months for crossing Thorung La. 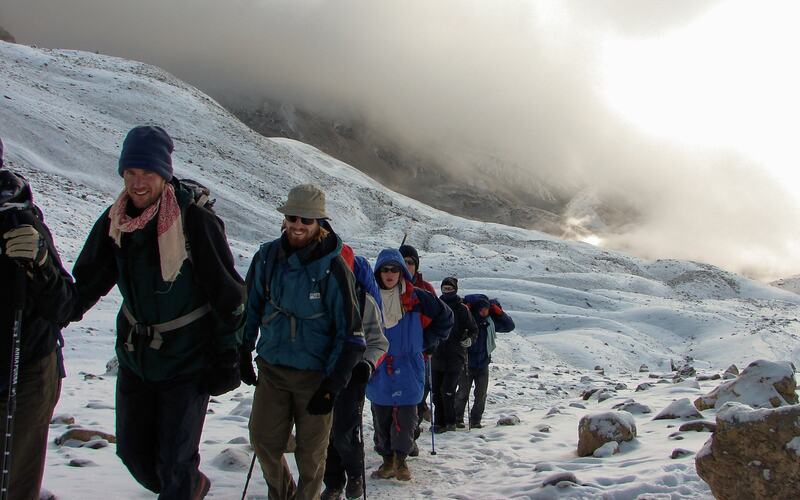 Of the 20,000 trekkers who made the crossing in 2013, 6000 of them did it in October! We were there on October 21 and walked into a beautiful day. As we made our way up the first steep section to a plateau where things seemed to level out a bit, the trail created by the previous day’s and week’s walkers was clearly visible. Every once in a while there would be a cairn or other marker to show where the path was. 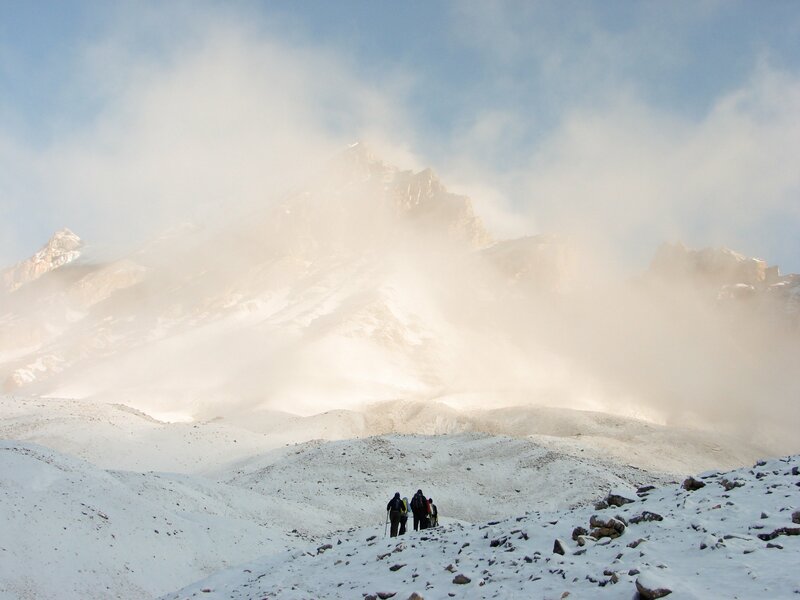 All it would have taken is a major snowfall or an incoming blizzard to turn our scenic and occasionally breath-taking walk into a full-blown difficult mountaineering situation where staying on track or finding shelter would become the #1 priority. Walking inside a ping pong ball is the best description that comes to mind to describe what it is like to be on the trail with heavy snowfall. 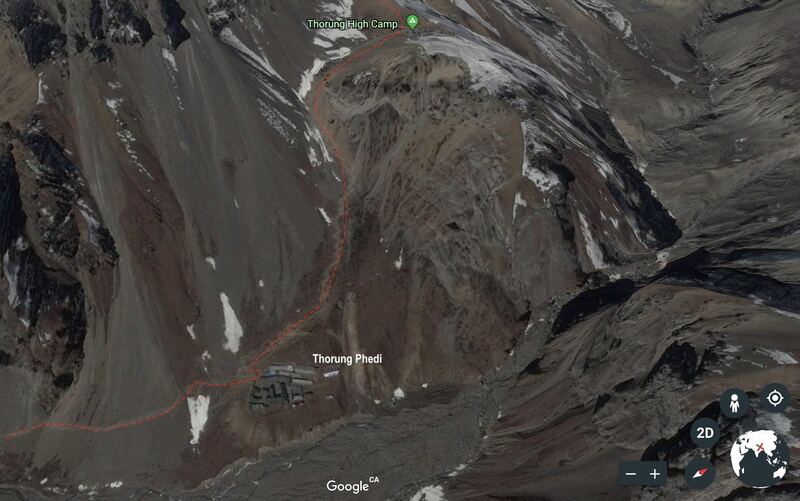 Walkers are pretty exposed and there is really nowhere to go – other than returning to Thorung Phedi, there is a hut/teahouse at the pass, and another lodge (4100 m) on the Muktinath side of the day’s walk. While most trekkers are pretty well-equipped, there were some doing the trek who had clearly made a last-minute decision in Kathmandu or Pokhara to do the famous Annapurna Circuit on the cheap (i.e no guide or porter) and without the better-quality gear you need. ponies ready to be rented out to tired trekkers! For four hours we walked through stunning mountain scenery on a pretty good hard-packed trail; as the hours passed, anticipation rose every time I saw what looked like the final ascent. The following image illustrates once such situation – the ridge top we were approaching looked like it could be the pass! Well, wish all you want but the pass will come when it comes – until then, just keep moving your feet and you’ll get there when you get there! 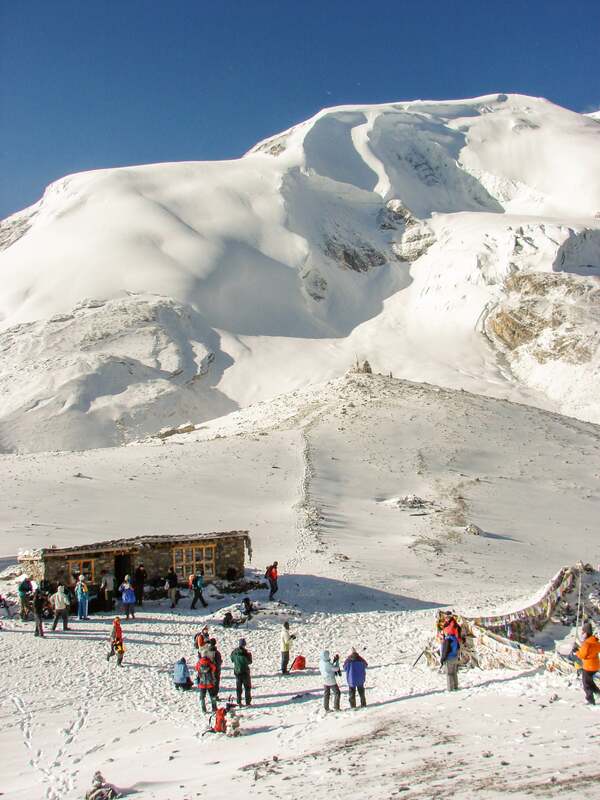 The peak behind the teahouse is known as Thorung Tse or Thorung Ri (6144 m). Behind it but not visible from the pass is the even higher peak of Khatung Kang (6488 m). I’m sure a few people have stood at the pass and looked up and thought – “Wouldn’t it be neat to quickly go up there and see the view!” However, both are in the expedition peaks category and need additional permits on top of the trekking permits all trekkers on the Circuit have to get. 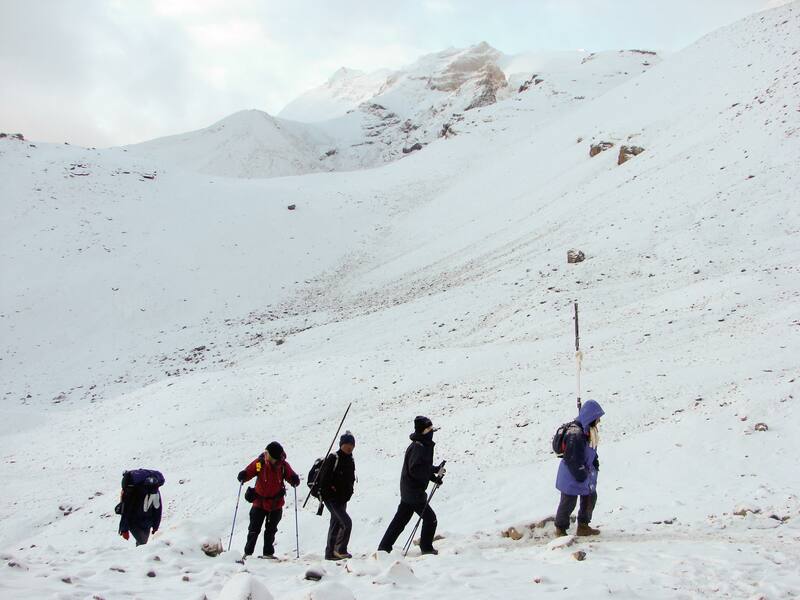 Given the above, as well as the first very steep and icy approach and the reported danger of avalanches, a basic Annapurna Circuit trekker would be foolish to enter the realm of mountaineering without the proper gear and skills and guide necessary! 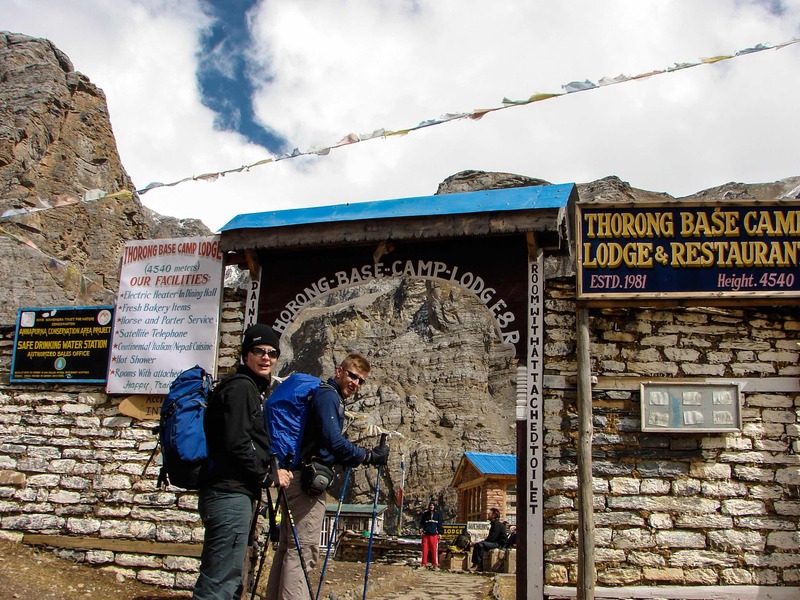 Thorung La Sign – the compulsory “I wuz here” photo! It is on the downhill that the trekking poles become even more valuable. 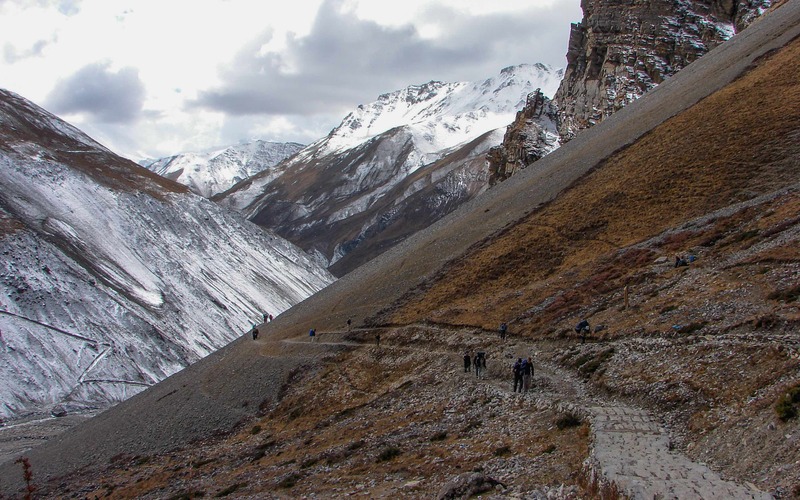 While they are useful for balance and propulsion when going mostly up, being able to stabilize yourself and break your forward motion at times makes the 1600-meter descent to Muktinath easier to take. A major plus is that your knees are spared the usual punishment they take on downhill stretches since some of your weight is transferred to your upper body. I’ll admit that on first seeing the poles in use around Chamonix in the Alps I thought they were an affectation that only a wussie Euro would take to. Well, live and learn. I would never go on a trek without them again! trekkers making the steep descent from Thorung La – note the almost invisible trail marker! 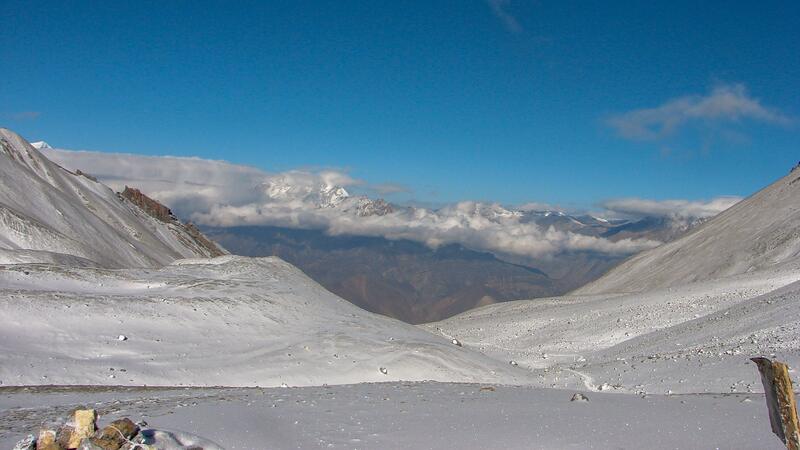 We got to Muktinath around noon. we were now at 3800 meters and all the worry of Acute Mountain Sickness was gone. After a celebratory lunch we dumped our gear in our rooms at the lodge and walked back up to the temple area; Muktinath is a major Shiva pilgrimage site for Hindus. 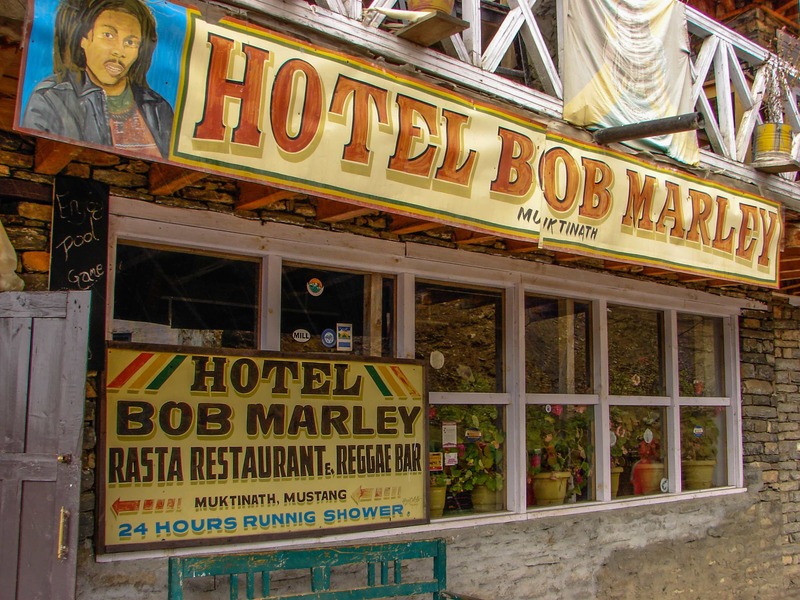 We eventually found our way to another shrine – the Bob Marley Hotel! What is it about the popularity of this Jamaican reggae singer in India, Sri Lanka, and Nepal? It is as if he is the patron saint of hippy travellers! Our visit involved bottles of beer – the pressure was off. Time for the pilgrims to do a little celebrating! 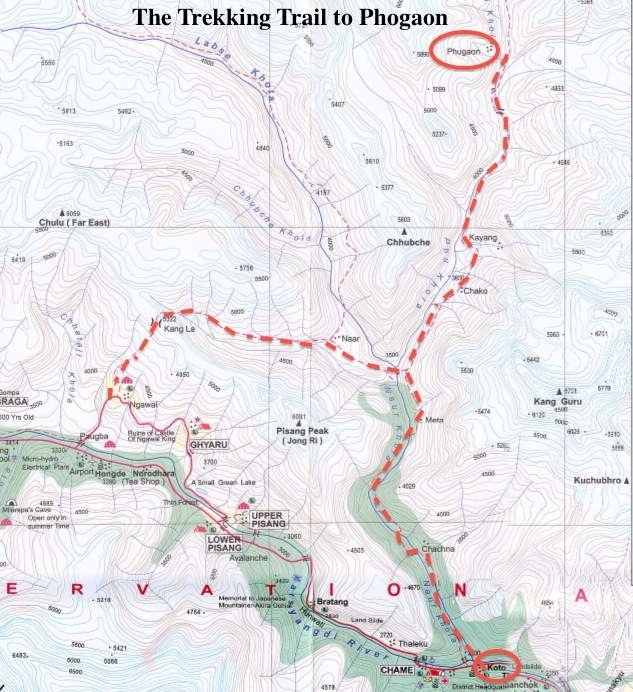 if you’d like to see the entire Annapurna Circuit in 1:125000 detail here is a map produced by Shangri-La Maps in Nepal. 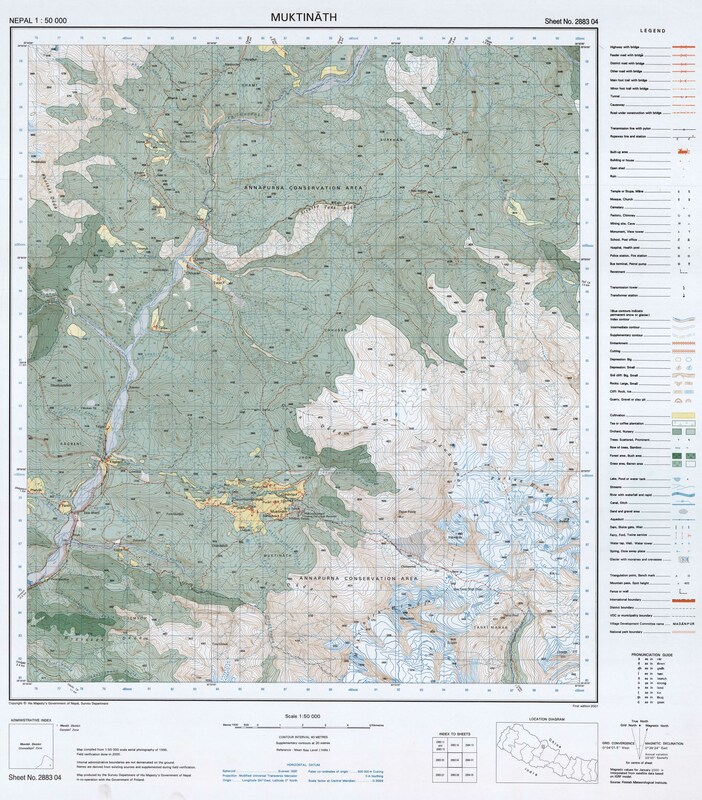 A more recent map (updated 2012) published by Himalayan Map Housecan be found intheir Kathmandu outlet. It is a laminated map which should last the duration of the trek! If you want to see what the map looks like and/or download the map in sections to your smart phone, access it here. Lonely Planet has a very useful updated edition of the Trekking In the Nepal Himalaya guidebook. The new 2015 edition will answer almost any of your questions if you are considering the trek and want to know how to proceed. The chapters on “Planning Your Trip”, “Kathmandu”, and “annapurna” can can be downloaded as a pdf files for $5. See here. It would be cheaper to buy the whole book! The Cicerone guide-book series recently (2013) published a new edition of their Annapurna guidebook. I have used their books in the Alps and the Everest region and find them worth taking along in my pack. See here for some info. 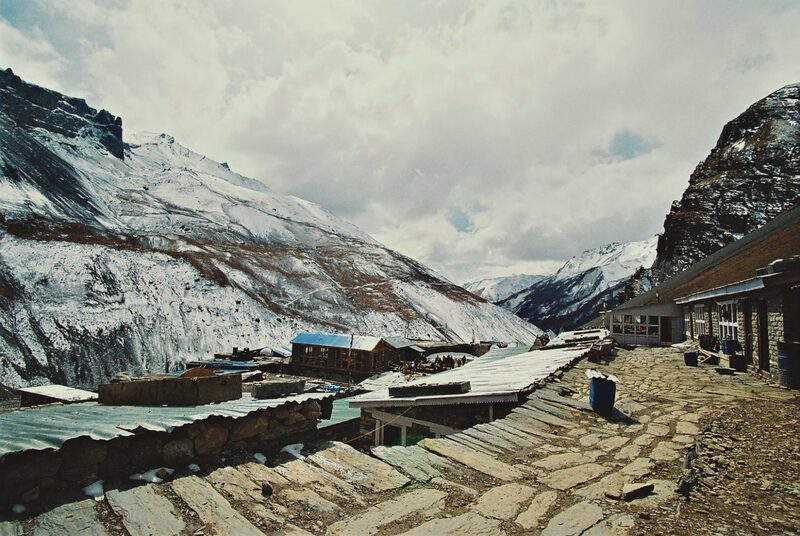 I’ve got another post on Annapurna – The Annapurna Circuit: Is It Still Worth Doing? – that might have some useful information and suggestions and other links. Click on the title to check it out. Update October 2014: Devastating News. 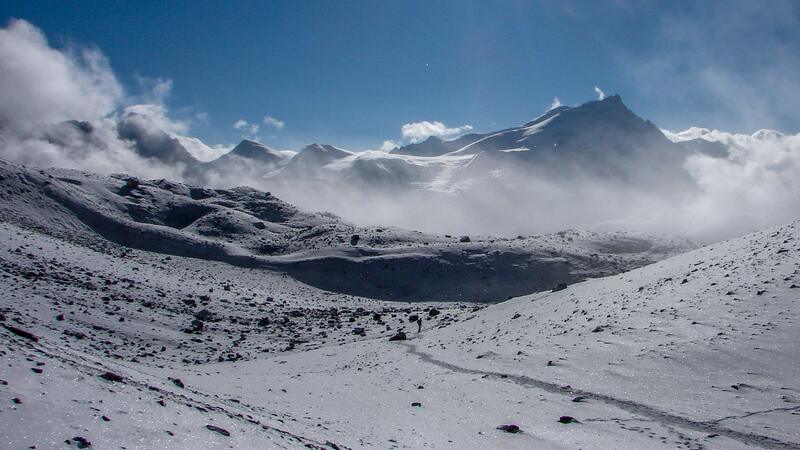 The Annapurna Circuit is in the news – and not in a good way. Since October 14 the number of deaths has gone up into the dozens [it now stands at 39] as the Thorung La area recovers from a massive blizzard caused by the tail end of Tropical Storm Hudhud which swept up from the Bay of Bengal. 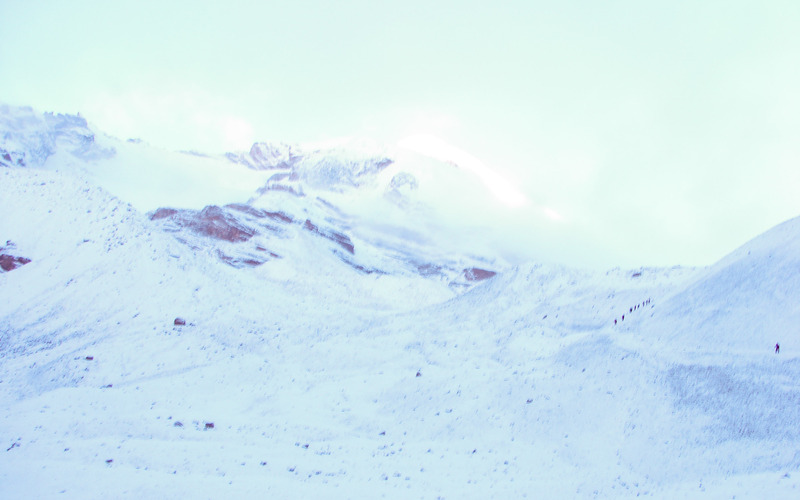 The result was landslides at lower altitudes due to massive amounts of rain and avalanches and blizzard conditions higher up because of the wet snow and wind. 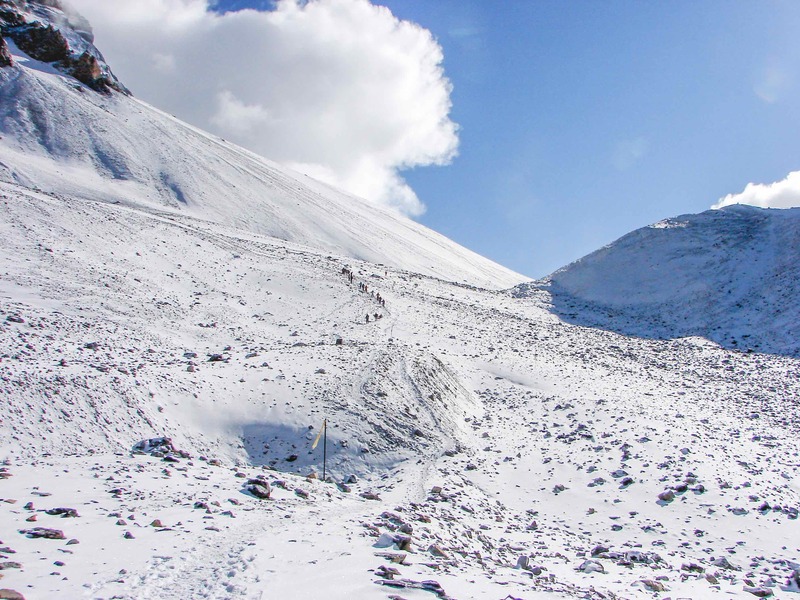 Apparently some trekking parties – some with guides, some not – decided to make what is normally a four-to-six-hour crossing of Thorung La in spite of poor weather. They may have been betting that the worst was over and they’d get across without a problem. Instead, they were walloped by a worsening blizzard that caught them unprepared both in terms of gear and dealing with a full-out emergency mountaineering experience. 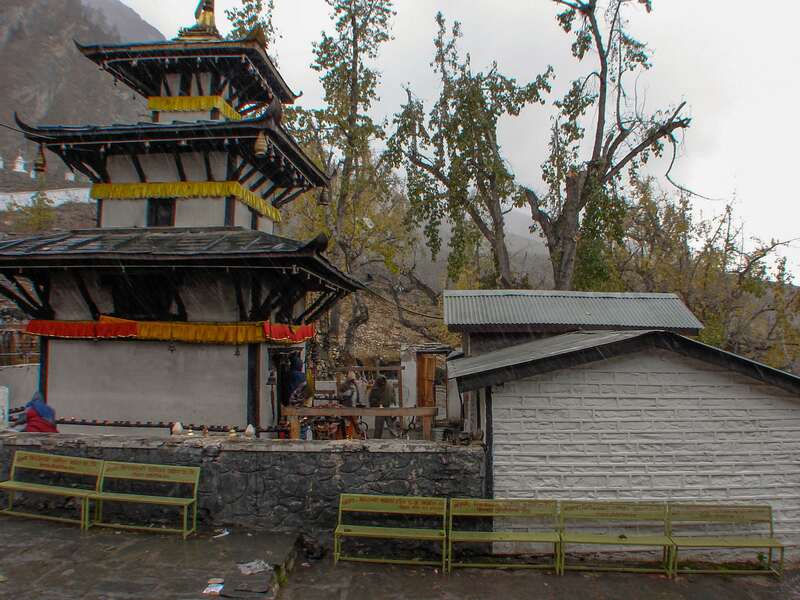 While some trekkers took shelter at the teahouse at the pass itself, apparently it was those who continued on down to Muktinath that lost their lives. There were also deaths on an Annapurna side trail from Koto (just east of Chame) up the Naur and Phu Kholas to Phugaon (map here). 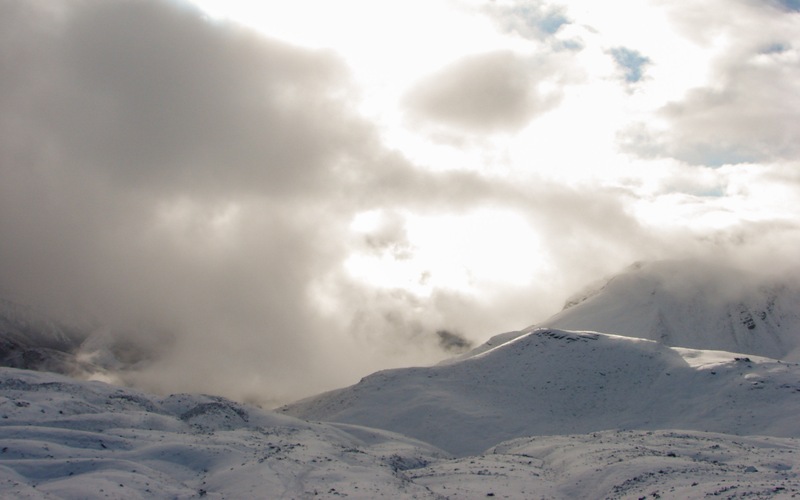 Four Canadians, an Indian, and three local villagers were killed in an avalanche. 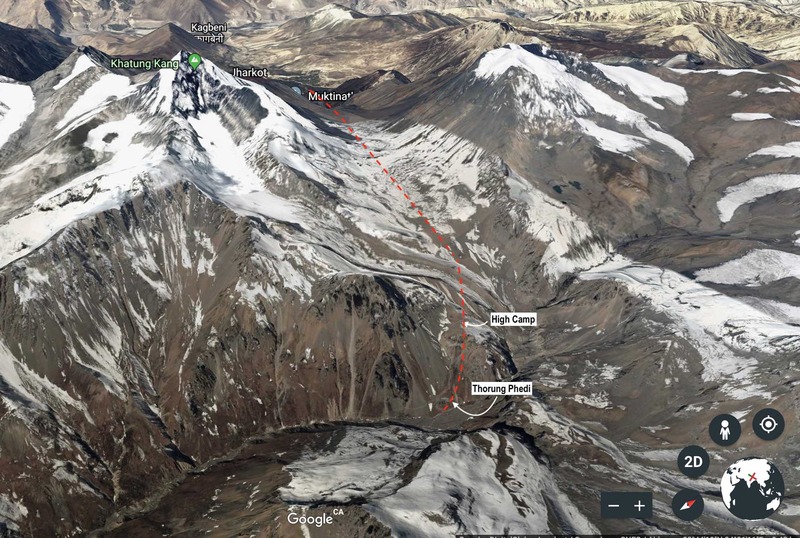 To the west of Jomsom at the Mount Dhaulagiri Base Camp, two Slovak mountaineers and three Nepali mountain guides were also killed in an avalanche as they prepared to summit the mountain. In time more details will emerge to help us make more sense of what must be the darkest day in Himalayan trekking and climbing history. My condolences go out to the families and friends of those trekkers and guides who lost their lives. The survivors’ stories make for some uplifting – or depressing – reading. This BBC report from October 18 (Nepal Annapurna: Trekking Disaster Toll Reaches 39) provides an overview. An Israeli’s story provides an explanation of why so many died on the descent from the pass.the UK’s Telegraph highlights his account in this article – Nepal trekkers ‘kicked out of lodge during snow storm’ blame local greed for eight deaths. 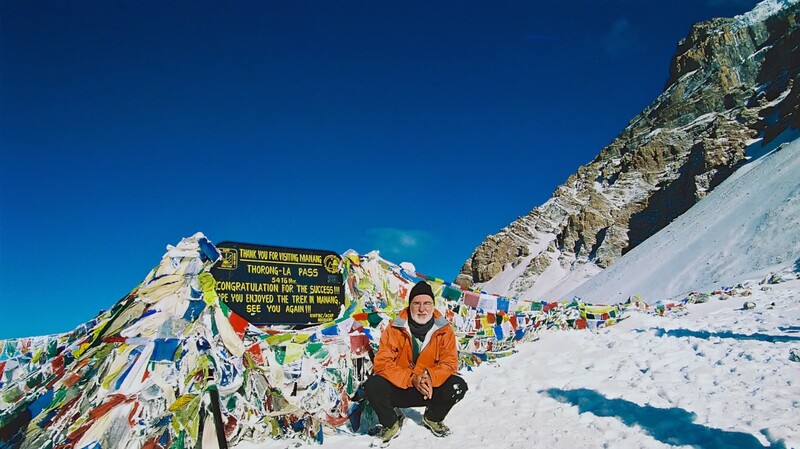 This entry was posted in hiking/trekking, Nepal and tagged Annapurna AMS, Annapurna blizzard, annapurna circuit dangers, Annapurna Circuit deaths, Annapurna dangers, sleep low, Thorung La, Thorung Phedi, walk high, walk high sleep low. Bookmark the permalink.